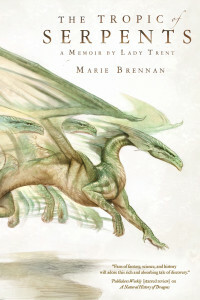 I got to interview Marie Brennan, the author of A Natural History of Dragons and its recently released sequel The Tropic of Serpents, which I consider one of the best new fantasy series’ that I’ve read over the past year. Marie is a former academic with a background in archaeology, anthropology, and folklore, which she now puts to rather cockeyed use in writing fantasy. She lives in the San Francisco Bay Area. 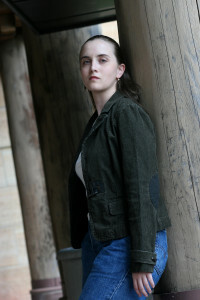 In addition to many short stories and novellas, she is also the author of A Star Shall Fall and With Fate Conspire (both from Tor Books), as well as Warrior, Witch, Midnight Never Come, In Ashes Lie, and Lies and Prophecy. You can find her online at SwanTower.com. I’m also giving away two sets of A Natural History of Dragons and The Tropic of Serpents – see the bottom of this post for details. Thanks for doing this interview, Marie! A Natural History of Dragons and The Tropic of Serpents were two of my favourite books from last year (I was lucky enough to receive an ARC in December) and I’m thrilled that you agreed to an interview. 1. Isabella’s world is clearly an Earth-analogue. Why did you make the decision not to set it in our world, and how much historical research do you usually do for each setting? I wanted the ability to comment on real-world history and culture (which is why I didn’t invent a setting out of whole cloth), without being constrained by the specifics of how things happened in our own past. There’s always alternate history, of course — but if I wanted to write about a version of West Africa where the slave trade never really took over, I would personally feel obligated to work out what changed in order to send events down a different path, because just hand-waving it would cheapen the significance of the actual conditions. And if I worked it all out very meticulously, then I would have to convey that to the reader, and pretty soon I’m writing something other than books about dragons. Not to mention the effect the dragons themselves would have on history! As for research, I do a fair bit of reading into the cultures I’m using as my inspiration, trying to get a feel for social organization, religion, that sort of thing. Nothing gets replicated with 100% fidelity — the dominant “European” religion is based on Judaism, I put Finnish saunas (and Russian overlords) in the Romanian-inspired Vystrana, and Bayembe incorporates elements of both the Ashanti and the Yoruba, to name just a few examples — but I enjoy doing that kind of research, because it teaches me not just to default to the familiar. 2. How many memoirs does Lady Trent end up writing? It seems like her exploits will take up at least a dozen volumes! Not everything in her life merits a whole book! There will be five in total, each one covering a different major expedition. 3. When do we meet Lord Trent? 4. Can you give us a little hint about what the third book is about, and what excites you the most about it? It’s called Voyage of the Basilisk, and the title is a pretty good pointer toward its general topic: Isabella goes on a voyage around the world, a la Darwin’s Voyage of the Beagle, to do a comparative study of sea-serpents and dragons in other regions. I think the bit I’m most excited for is the archaeologist character I introduced — someone interested in Draconean ruins. Quite apart from the fact that I used to be an archaeologist and therefore share his interests, he was a lot of fun to write. 5. Are you interested in ever releasing Lady Trent’s non-memoir books? I would love to read her fluffy travel book – I’m sure it would have a lot of hidden snark! This seems to be something a lot of people would go for, so maybe! It would be a nifty side volume to add to the series. I have three other series out there, though one of them is only in its first volume so far. The Onyx Court is a set in London during different historical periods, with a faerie court hidden beneath the city interfering with its politics. The doppelganger books are more straightforward adventure fantasy, in a secondary world with witches and people who are basically ninja by another name, and then Lies and Prophecy is the first in a series of near-future urban fantasies, in a version of our world where psychic gifts have become common. 7. What is your writing process for a new book like? Do you start with the characters, the plot/themes, or the world? Inasmuch as I can generalize, I guess it’s usually a character in a situation or setting. 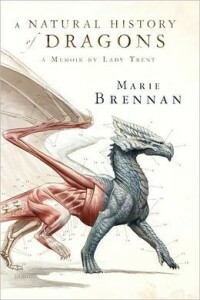 The Memoirs of Lady Trent, for example, started with the notion of a natural historian trying to study dragons, which lent itself very well toward a Victorian-type setting. Lies and Prophecy started with a young woman studying divination at college. I usually have to play around with the idea for a while before I start figuring out the plot, though there have been exceptions. 8. What are some books you think everyone should read? This is the kind of question that makes me wave my hands inarticulately, because where do I start? I think I’ll recommend Diana Wynne Jones, a British children’s author who wrote some truly amazing stuff. I grew up on her books and still love them today — to the point where, when she passed away a few years ago, I re-read all her works and blogged about them as I went. 9. If you had to write a book about Isabella teaming up with a character from another fictional universe, who would it be and why? I think she would get along splendidly with Kate and Cecy from Patricia C. Wrede and Caroline Stevemer’s Sorcery and Cecilia. And Isabella would be delighted to have magic to help out in her work! As I mentioned above, Tor has given me two sets of these books to give away! To enter, please email me at kriti@justaworldaway.com with subject “The Tropic of Serpents” and your name and mailing address (US/Canada only). This giveaway is open until April 21, 2014. If you can’t decide whether to enter, here are the covers and blurbs to help you out.